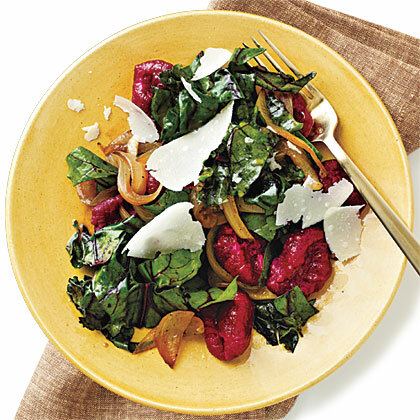 When I saw a recipe for beet gnocchi in the latest issue of Cooking Light, I jumped all over it. Maybe it has something to do with the fact that I have a July birthday, but I can’t turn down ruby-colored things. This includes red velvet, anything involving beets, and, well, actual rubies. Knowing root vegetables take forever to cook, I popped the beets and potatoes in the oven as soon as I got home at about 5:15. An hour later, the potatoes were pretty much still rock hard… of course, so I put them back in the oven. It was close to 7 by the time the veggies were finally done cooking. At this point you’re supposed to use a potato ricer. I have no idea what a potato ricer is, so I just mashed everything up in my food processor. If you’ve ever made gnocchi, you know that the telltale sign that they’re done is that they will float to the top of the pot. We watched a single piece of gnocchi float around at the bottom of the pot, occasionally looking like it was about to emerge from the water, only to be sucked back down to the bottom. This was at 8 o’clock and I made an executive decision to run across the street to Target and just buy gnocchi. That way, we could still finish the recipe and not waste the 6 cups of onion Joey had just chopped. Joey is like the poster child for never giving up. When I got back from the store, he had managed to roll out more of the dough, cook the dough, and sauté the gnocchi with some of the beet greens and onions. We went ahead and cooked the store-bough gnocchi, just in case ours tasted horrible. Last night’s dinner adventure had its fair share of setbacks, frustrations and failures, but you know what, we had a blast together in the kitchen. It took me back to the days when we first started cooking together. When we burnt the bottom of pans, couldn’t get chicken to cook for the life of us and made laughable mistakes. Until last night, I almost forgot that the experience of working and learning together in the kitchen is what made me love cooking in the first place. So here’s to many more cooking adventures. Frustrations, mess-ups and laughter included. It is so wonderful that you two can cook together. We are opposites in my house. Which ever one is cooking gets aggravated if the other one trys to help. Usually we just divide up the tasks. Like he will grill while I do the stove cooking!! It’s nice to have somebody mess up with you! Can I just say that THIS IS THE BEST POST EVER!?!?!? I love you sissy! This post is so REAL!!! !